Engineer and pioneering naval architect. Born in Glasgow and educated at the University of Glasgow, Russell was appointed Professor of Natural Philosophy at the University of Edinburgh, aged just 24. He later went on to work in London. He developed an interest in the construction of steam engines for road transport and set up a steam carriage service between Glasgow and Paisley in 1834. He is noted for his innovative work on ship design. He contributed significantly to the design of Brunel's Great Eastern, launched in 1858. In 1860, he designed HMS Warrior, the world's first ironclad battleship. While testing a new experimental design on the Union Canal at Hermiston, he observed that a canal boat stopping suddenly gave rise to a solitary wave which travelled down the canal for several miles, without breaking up or losing strength. Russell named this phenomenon the 'soliton'. Russell built at 9.1m (30-foot) long tank at his home in Stafford Street in Edinburgh's New Town to study these waves. Today, similar waves are of key importance in carrying information along optical-fibre communications networks, which are the back-bone of the telecommunications industry and the Internet. 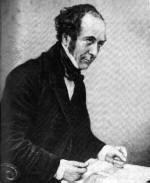 Scott was Secretary to the Great Exhibition held in London in 1851 and founded the Institution of Naval Architects. He published his landmark treatise The Modern System of Naval Architecture in 1865. In 1995, the aqueduct which carries the Union Canal over the Edinburgh Bypass (A720) was named the Scott Russell Aqueduct in his memory.